Peacefully, at Grey Bruce Health Services, Southampton, on Tuesday, March 12th, 2019 in his 85th year. Bob, proud father of Theresa Smith (Rod) of Meaford, and Terry Kerr (Lisa) of Southampton. Loving Papa of Adam Smith (Marla), Kara Rogers (Brent), Jared Kerr, and Madison Kerr. Great grandfather of Addisyn, Xavier, and Aidynne. Also, survived by Helen Kerr, a good friend and mother of his children. Predeceased by his brother Howard. A Celebration of Bob’s Life will be held at the Royal Canadian Legion Br. 340, 630 Green Street, Port Elgin on Friday, March 29th, 2019 from 1:00pm to 4:00pm with remarks at 2:00pm. 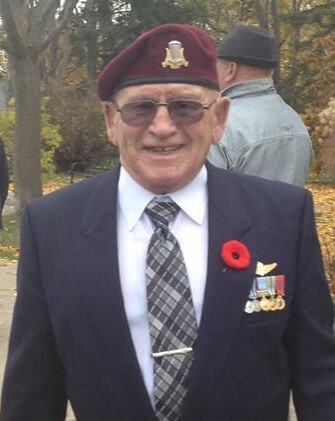 Bob proudly served his country in the Canadian Armed Forces and was a Korean War Veteran. He will be remembered for his wonderful sense of humour and greatly missed by all that knew him. Memorial donations to Diabetes Canada, the Saugeen Memorial Hospital Foundation or the Salvation Army would be appreciated by the family.